Blockchain Modern Machine Shop 77 accessible only to those who own it and those who are authorized to view it. A blockchain— and the intellectual property therein—is inher- ently secure and always up to date. • Lack of transparency. Authorized parties enjoy instant access to their blockchain-secured data from any location. There is no need for tradi- tional usernames, passwords, firewalls or other complex (and potentially vulnerable) safe- guards. Part data, process data, and data used to track orders, production and shipping can f low freely. • Lack of efficiency. Blockchain-based automa- tion eliminates inefficiencies ingrained in manual tasks like drawing up RFQs, submit- ting bids, reviewing proposals and tracking paperwork. Automated, condition-based and instantaneous transactions make payment for work both timely and guaranteed (a particular advantage for cash-strapped smaller shops). Miscommunication, mistakes and delays associ- ated with back-and-forth among human beings become less common. Taken to the extreme of its potential, block- chain could make sourcing parts as easy as using a ride-hailing ser vice like Uber or Lyft, Mr. Goodwin says. In this future, machine shop and prospective customer connect directly and anonymously, matched by computer programs that pull blockchain data to compare machining resources to work requirements. There is no need for the customer to worry about the shop's capacity, capability or reputation, because the shop has already been vetted according to ser vice history, machine specifications, quality certifications and other records embedded (and securely encrypted) in the blockchain. When the work begins, blockchain automa- tion can streamline complex, typically manual tasks associated with ordering parts, tracking production throughout the supply chain and processing payments. Getting there will not be easy. 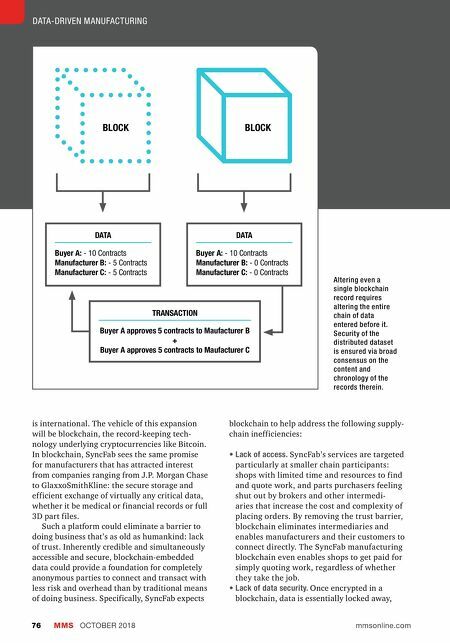 At the time this article was being written, SyncFab users were taking their first, tentative toe-dips into blockchain. The MFG Token, a new form of cryptocurrency that is to be the lifeblood of the evolving network, had only just been inte- grated. No matter. Whatever the future holds, machine shops using this ser vice will likely get a head start in leveraging a technology that could transform not just manufacturing, but the entire economy. They will be prepared if the day ever comes when customers demand levels of transparency, data security and communications and transaction efficiency that only blockchain can provide. Safeguarding Data Blockchain is perhaps easiest to understand in the context of its most basic functionality: a record- keeping system for monetary transactions (the most well-known blockchain is designed specif- ically and only for buying, selling and storing Bitcoins). SyncFab's blockchain stores records of transactions conducted with the company's new MFG Tokens. Like Bitcoin or any other cryp- tocurrency, the MFG Token is essentially a form of digital cash (hence the term "currency") that A blockchain—and the intellectual property therein—is inherently secure and always up to date.